Yoshida, Hiroshi (1876 - 1950), "Return of Fishing Fleet"
Very fine, with superb colors. Notes: A rare over-sized dai-oban design, displaying richer colors then the example shown in the Abe catalog. Brush signed and sealed by the artist. Juzuri seal in the lower left margin. 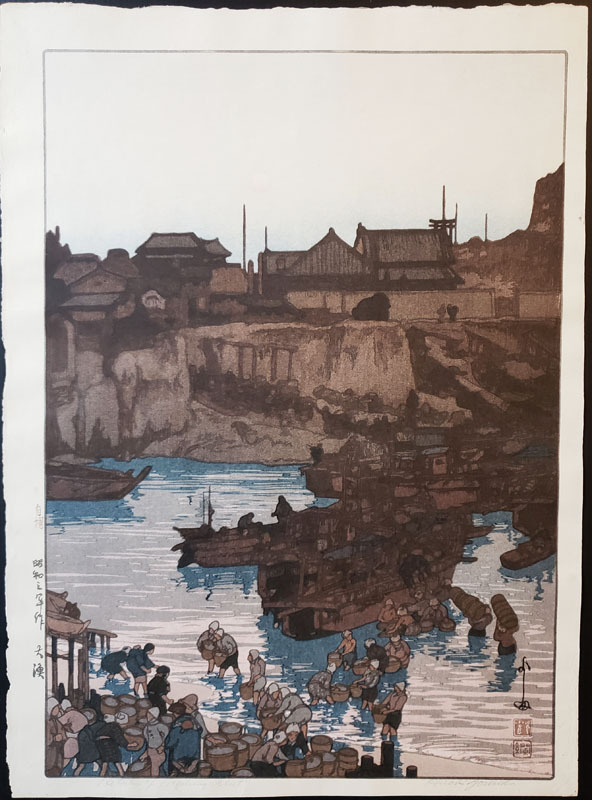 Yoshida used eight separate blocks and thirty-one impressions to make this print. Hiroshi Yoshida is known as a Western-style painter and printmaker. Born in Kurume, he lived and worked in Tokyo. He first painted landscapes in oil, but won early fame as a watercolorist. He developed an interest in printmaking in 1920 and self-printed all of his work except his first seven prints. His early printwork depicts views of Swiss and American landscapes. Fond of traveling, Yoshida was also an avid alpinist, with mountains and water figuring prominently in his works. A significant contributor to and organizer of important exhibitions at the Toledo Museum of Art, Yoshida's work was well represented, with 113 prints in the 1930 show and 66 prints in 1936. A romantic realist, Yoshida's style resembles that of an English 19th Century watercolorist applied to Japanese themes. Hiroshi Yoshida is noted for the subtle colors and naturalistic atmosphere. His works won numerous prizes in Japan and in the world, gaining strong Western influences during his travels. He later established the Japan Alpine Artist Association.